Gathering String continues to generate strong reviews on Amazon. The banter between the characters was believable and entertaining. And their flaws were human and endearing. The story had enough twists and turns to keep me turning the pages to find out what would happen next. Right from the start you are caught up in the characters! That’s 24 total Amazon reviews of Gathering String (two reviews are repeated on the print and Kindle listings), with 17 giving the novel 5 stars and six awarding 4 stars. You can read the Kindle edition on an iPad, phone, computer or other device using the Kindle app. If you’d like to schedule a visit to a bookstore, library or book club in the Washington area, you may contact the author at mimi (dot) johnson (at) me (dot) com. 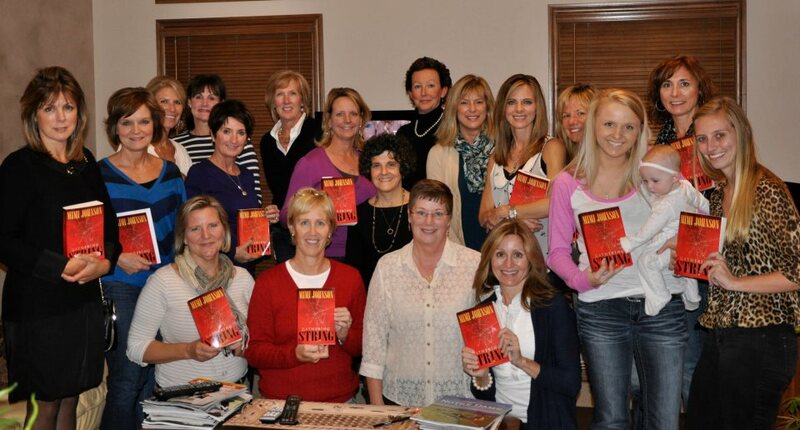 Gathering String author Mimi Johnson, center, without book, met in Dublin, Ohio, with a book club whose members read and enthusiastically praised Gathering String. Recent reviews praise Gathering String for its memorable characters and relevance. Gathering String is a great political journalism thriller, with good character development and pacing. I also enjoyed how the novel makes references to digital and social media and the changing journalism industry. It’s a very relevant and timely novel, and overall great read. This is a book with memorable characters and an engaging story, timely and well told. Finishing “Gathering String” made me want to read another chapter; made me want to know what happens next. That’s about the best compliment I can pay to a work of fiction. After a successful book tour in Iowa, author Mimi Johnson heads to Dublin, Ohio, this week to discuss Gathering String with a book club. The Iowa tour also included a book club visit as well as public readings at Beaverdale Books in Des Moines and the Shenandoah Public Library. Mimi Johnson leaves for Iowa today for a book tour promoting Gathering String. In advance of the tour, she was a guest on KMA radio in Shenandoah, Iowa, Friday. You can listen to the full segment. One correction: In the lead-in, the hosts refer to Mimi having “worked at” the Washington Post and Omaha World-Herald. She contributed to both publications as a freelance writer, but has not worked as a staff member for either newspaper.